Sending an email can be as good as having a real conversation with a person. If you are a business using email for your marketing activities, you must be adding personal touches to your emails to make it look and sound more tailor-made and relevant. Personalized emails stand out in the subscribers’ inboxes as highly relevant emails that speak directly to them. When the emails that the subscribers receive in their inbox cater to their needs and interests, it builds trust in them and improves customer relationship and experience. Email personalization is a tactic most email marketers have started to use widely in their email campaigns. It is because using email personalization has proved to bring great benefits to businesses. According to GetResponse, personalization in the email body has an open rate of 29.95% and a click-through rate of 5.03%. Epsilon research found that 80% of customers are more likely to make a purchase when their experience is personalized. Lack of personalization may cost organizations up to $2.5 trillion, according to Accenture. In this blog, I’ll show you some great reasons why marketers should personalize emails. When your subscribers opt-in to your email list, they fill certain details in the form such as name, company name, country, etc. in addition to their email address. Since you ask them to fill in all these details, you need to utilize the data conventionally. Put your data to work. Use the location details to know their time zone and to determine the most suitable time to send them emails. Use the ‘First Name’ in the subject line or to address them in the email. This will help build trust. Customer data is like currency. When your customers reveal their data, they expect you to put it to good use. They anticipate only relevant emails in return for the data they provide. Sending personalized emails can make subscribers feel special. When you address someone with their ‘first name’ AND send relevant content, it seems as if it is a friend sending them an email instead of a business. This increases click rate and improves the credibility of your brand and business. When you send relevant and tailor-made emails, more subscribers will open, read, and engage with your emails—helping you amp up the open-rates and click-through rates of your emails. When you have a focused approach to cater to the needs and interests of your subscribers, it will also save you a lot of money and help generate better conversions from the emails you send. 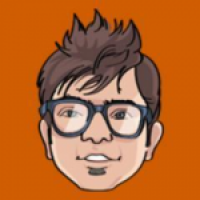 What Needs to be Personalized? If you’ve been using personalization, but are not sure if you are doing it right, here’s which elements of your emails can be personalized and how to do it right. The copy of your email lets you convey your message to your subscribers. If you have some details about your subscribers, like their interests, gender, or even their name, you can use these details to create email copy that makes them feel closer to your brand. The performance of your business is directly or indirectly dependent on the offers you promote to customers. Your promotional offers should tap into the core needs and interests of your target audiences. Sending the right offers to your customers and subscribers will keep them interested in your brand and restrain them from moving over to your competitors. This email from Skullcandy gives early access to their VIP members for their offers. This builds brand credibility and persuades them to buy. Integrating your customers’ browsing history and past purchases will help you send hand-picked recommendations to them. When the suggested products are highly relevant to their interests and needs, they are most likely to make the purchase. Use behavioral data and past purchase data to create real-time, customized product recommendation emails that can improve your conversions. Here’s an email from Canopy. This email features recommendations based on the interests of the subscriber, which are cooking and baking. By closely monitoring their every move on your website, you can send accurate product recommendations. Images draw more attention than text or any other details. If you add personalized images in your email, more subscribers will view and click through it. Represent details of your subscribers in the form of pictures to grab their attention and keep them interested in your brand’s emails. 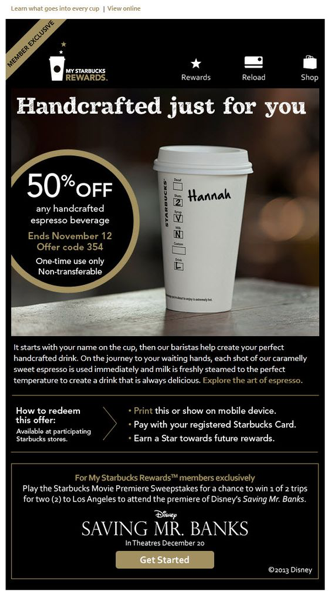 For example, this email from Starbucks uses the subscriber’s name in the email image. Paying attention to customers who abandon your products halfway through a purchase is of utmost importance to your business. Keep your subscribers engaged with your brand by sending personalized cart abandonment emails featuring relevant messages for items left behind in their cart. Check out this example from MCM. The email includes the images and details of the abandoned products, along with related products that the subscriber might be interested in purchasing. Using the right first name: Make sure you address your subscribers correctly. Wrong first name personalization can be detrimental for your brand and even lead to unsubscribes. Sending to the right segment: Email segmentation is an important part of email marketing process, and you need to double check while creating and sending emails to specific segments. Sending at the most suitable time: Irrespective of how good your email is, you need to send them at a time when it is most likely to garner the subscriber’s attention. Including relevant content and product recommendations: Create product recommendations based on each individual subscribers’ purchase history and interests, instead of sending the same product suggestions to everyone on your list. With more and more businesses using personalization in their email marketing strategy, it is very necessary to know how to do it effectively. Make sure you choose what’s best for your business and target audience and personalize wisely.